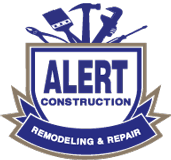 Alert Construction is a full service house painting company based out of Greensboro, NC. Our company's main focus is exterior painting during the late spring, summer, through fall, and interior painting during the winter months. At Alert Construction our experienced painting contractors make sure to fully clean the exterior of your home before working, to give us a clean canvas to work with for optimum results. We want the best end product for you, so this is part of our preparation steps on exterior surfaces whenever needed. It's a value added to you with an exterior painting job. During our painting cost estimates, we will discuss the importance of proper prep work and techniques to painting. In addition, a member of our team will walk around with you to point out problem areas that could be prevented in the future if that is helpful. At Alert Construction, we like you to be educated, just as we are when it comes to painting your home and factors that can affect your home. Alert Construction is the leading painting company in Winston Salem, Durham, Raleigh, Greensboro, Chapel Hill, Concord, High Point, Cary, Burlington, Danville, Statesville, Lexington and the surrounding North Carolina area. Contact us today for a Free Estimate on professional painting by our of our trained, certified contractors!